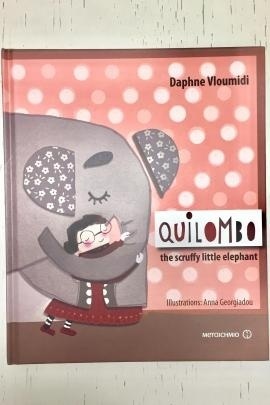 From the kids' book "Quilombo: the scruffy little elephant" (Metaichmio), written by Daphne Vloumidi - owner with her husband of hotel Votsala in Lesvos, where she rescued several migrants - in order to tell her experience and explain to the children from all over the world the importance to host and help people in need. In the summer of 2015, thousands of people from foreign countries, exhausted and terrified after difficult journeys, arrive on the islands of Lesvos, in search of a safer life for themselves and their children. Traumatic images and indescribable emotions for all of us on the island. We try to help. Temporary camps are set up as many refugees as possible cared for. To that effort, I contribute myself. That’s how this story was born and I dedicate it to all the children living in the refugee camps, but also to all those who sleep peacefully in their homes, with a toy animal in their arms.